I avoided always reading anything that had old Gothic or medieval or Victorian architecture. For some reason, I associated old architecture with horror stories. I know it was a cliché and ignorant though, but that was my thinking. 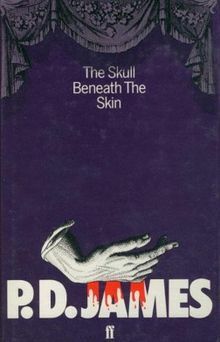 Last year, in one of my writing class, I reluctantly read the assigned book The Skull Beneath the Skin by P. D. James. Surprisingly, I enjoyed reading it. I loved especially reading about the female detective–Cordelia Gray. I find that there aren’t enough female detectives in the real and the fictional world. One assignment required me to write what-happens-next of the ending. Instead, I wrote the prequel and beginning of chapter one of a new book. (I don’t know if I can legally use the same character names. But that is an issue for later.) Since then, I have made zero progress towards moving the story. So, I am posting the opening and prequel here, in hopes that it will force me to write the first chapter. Newspapers called it the Courcy Castle Murder case–undoubtedly the most sensational case of the century. A bestselling author killed his former lover who was a famous actress because she made devious overtures towards her stepson. None of the newspaper articles delved on Simon Lessing death; he was not a star like Clarissa Lisle or celebrated like Ambrose Gorringe. There were full-page interviews of Clarissa’s cousin Roma Lisle. All the pictures portrayed Roma pointing or leaning or sitting or laughing in front of her brand new bookstore. Roma received one-third of Clarissa Lisle’s fortune, around eighty-thousand dollars. Roma’s married boyfriend left his wife. He wrote his memoir My Brush with Death about his knowledge of the murders. It was midway through the book, readers realized that he never met Clarissa Lisle nor he ever visited the Courcy Castle. It was almost near the end of the book, readers recognized that it was actually Roma Lisle’s recollections. Nevertheless, Roma promptly displayed her boyfriend’s book in every window of her bookstore. Inspector Grogan also became an overnight somebody. Newspapers printed his biography and his official portrait. He wrote newspaper columns about the goings of the Courcy Castle Murder case. He was commissioned to write a book about his experiences of the Courcy Castle murder investigation. Grogan received a special commendation from the New Scotland Yard. Prior to the Courcy Castle Murder trial, Sergeant Buckley located the printing factory that printed the Speymouth Chronicle. The printing factory maintained a registry of all original materials submitted to them. It was there, after days of sorting, in a pile of old pictures, Buckley found the picture that incriminated Ambrose Gorringe. During the tax evasion trial, the prosecutor Fernand Schmitz enlarged the accusing photograph by five hundred percent. He displayed it on a big Formica board; he handed copies of the picture to the jury. The jury returned a verdict in only thirty minutes; Gorringe was found guilty of tax fraud. Ambrose Gorringe was forced to sell his beloved Courcy Castle and all his Victorian necrophilia to pay his back taxes and expensive lawyers. During the duration of the Courcy Castle Murder trial, Gorringe was released on his own recognizance. Partly because there wasn’t any concrete evidence against him and partly because of his failing health. He lived in a one-room unit in the public housing on the other side of the Dorset coast. At night, for hours, Gorringe stood in front of the only window in his flat to stare at the Courcy Castle. Every night he cursed Cordelia. Unlike others, Cordelia Gray didn’t gain anything from the Courcy Castle Murder case. Only the first article declaring Simon Lessing’s death cited Cordelia Gray. The Speymouth Chronicle printed a picture of Cordelia of when she had applied for her detective license. The picture made her look young and the following article portrayed her incompetent. Sir George Ralston had offered Cordelia her fee but Cordelia declined. She explained that she failed in fulfilling her assignment. Since her fateful night at the Courcy Castle, Cordelia had gone back once to show the jurors the Devils Kettle. To make money, Cordelia located Nanki-Poo and many more cats and kittens. Nearly eight months ago, Cordelia Gray stood alone in the witness box to lay out the detailed timeline of her discoveries. She was the sixth witness of the defense. She stood firm in relating her conversations with Ambrose Gorringe. While Gorringe coughed his frailty in front of the jury, Cordelia remained affirm in her composure. The Courcy Castle Murder trial continued for four months and sixteen days, when suddenly during Fernand Steptoe’s cross examination of the bearded young boatman, who twice gave a ride to Cordelia, Ambrose Gorringe coughed loudly, spurted blood, and fell on to the floor. The image of his fallen corpse splashed the front page of all newspapers. In his death, Ambrose Gorringe gained more notoriety than Clarissa Lisle. Three months ago, Cordelia Gray attended the funeral of Ivo Whittingham. It was full of the pomp and circumstance, which Ivo would have hated. Following the reception, Cordelia was invited for the reading of Ivo’s will. Ivo Whittingham divided his estate into three equal shares. The first part went to the local hospital that cared for Ivo in his last days, the second part was sent to Rose “Tolly” Tolgarth, and the third part was given to Cordelia Gray for running her detective agency. Twenty-nine days ago, Cordelia received a letter from Tolly. The letter didn’t mention Ambrose Gorringe or Clarissa Lisle or Simon Lessing. Instead, it recounted the idyllic life of Tolly and Mrs. Munster’s. They didn’t worry about money; between the two of them, they had enough. Mrs. Munster had Mr. Munster’s money from his illegal activities and money from the sale of Clarissa Lisle’s jewelry. Tolly had her share of Ivo’s estate. Tolly and Mrs. Munster adopted a young Indian girl; she was of lower caste–an untouchable. Tolly, Mrs. Munster, and the young girl lived in a luxury ashram in Nagal, India. Their ashram rested at the foothill of old ruins of the Nagalghar Fort. For past few months, there were reports of inhuman unexplainable activities in the area surrounding the ashram. Cows and young men were found dead in the early hours of the morning. There were never any visible signs of foul play. Local residents of Nagal believed that the ghosts of kings and princes long dead were killing for revenge. Tolly wouldn’t believe in such balderdash; Tolly requested Cordelia for help.